Photo taken at Laguna Seca Ranch in South Texas March 27, 2019. Nikon D7500, Nikon 300mm f/2.8, 1/2500 sec at f/6.3, ISO 400, FF. Great trio and the BG nicely mirrors to branch and birds. Nice you got the eyes of all three. Nicely done Gene. How many Caracara's would you say are around the ranch these days? 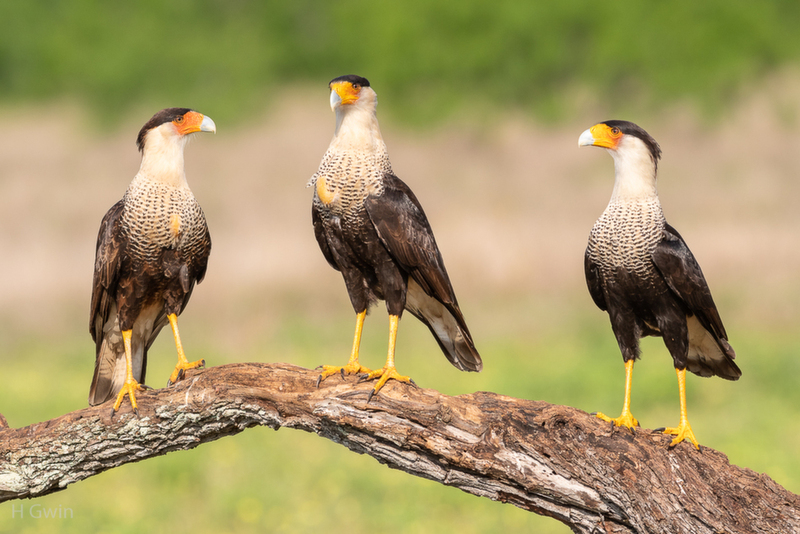 A great lineup of these Caracaras, Gene. Beautiful lighting and detail. Very nice! Jake, Starting in about April is the "off-season" for Caracaras. Most of the adults have paired up and are on nest. Some adults come in, but most are Juveniles. Personally, I prefer photographing Juveniles because their feathers are lighter and that allows the camera to capture better detail in the feathers. When I say off-season, I mean there are about 15 to 20 Caracaras that will come in. The most Caracaras that I've seen at one time is probably about 100. At some point, it becomes pretty hard to count them when they're all moving around. Thanks for asking. a great pleasant image to look at, wright on GENE. Outstanding image! Love how the outer birds are looking into the frame at the center bird. I need to come to your ranch. I like the way there just standing around. This appears to be fairly typical behavior for the species. Excellent job on the color, detail, light. very well done Gene. Good trio and the eyes showing. Looks like they have a discussion going on. Great shot.